This tag was number twelve of a series of 12 tags in the December issue of the Norwegian magazine - "Ett trykk". I wanted to show different styles and techniques. 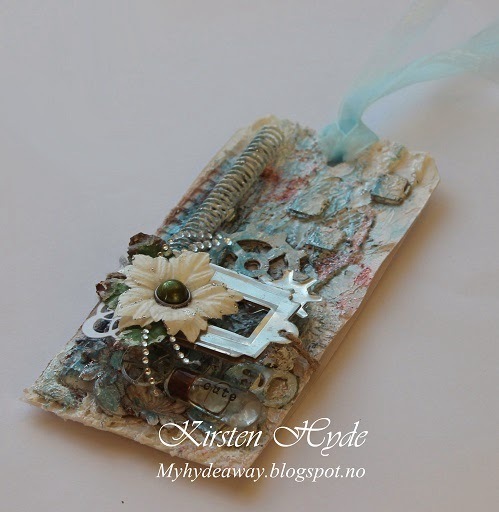 This is a tag inspired by Tim Holtz. 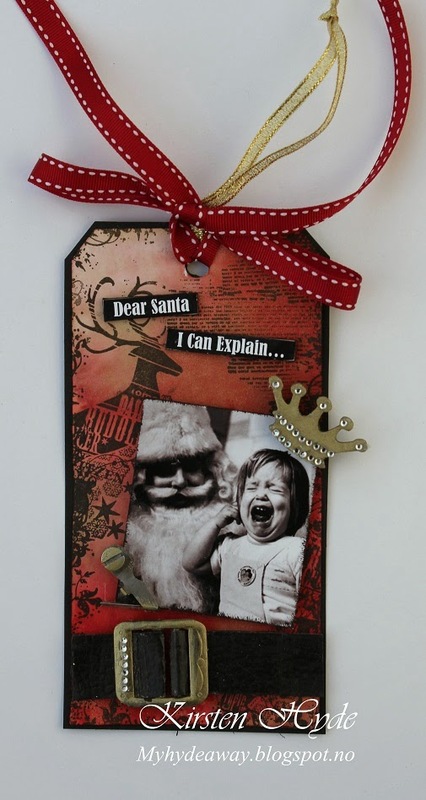 The original tag is made from Tim Holtz Sizzix Die TAG & BOOKPLATES Movers And Shapers. 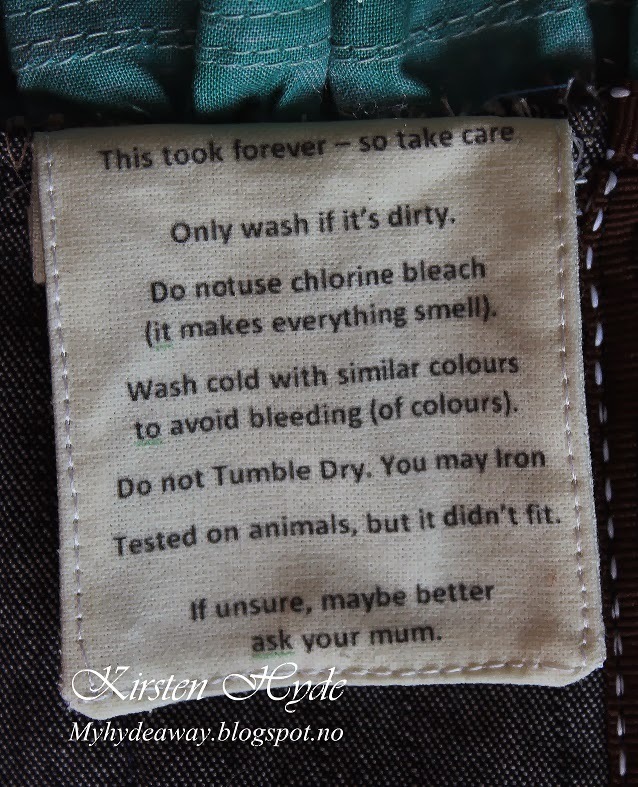 I sprayed the tag with Dylusions spray – Postbox red and Cherry Pie. Heidi Swap – Color shine – Gold Lame. The stamps are from Inkadinkado – Christmas Holiday sentiments – Reindeer. Prima Marketing - Tekststempel. 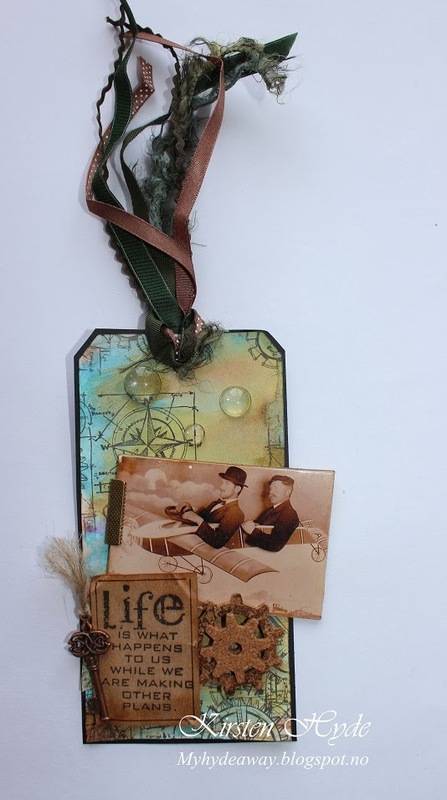 The photo is from Tim Holtz pages. The crown is a diecut with Sizzix: Movers & Shapers Magnetic Die By Tim - Crown. The diecut was painted with MetaMica - Pewter an bling was added. I have also used a small belt buckle, painted it with MetaMica and added bling. 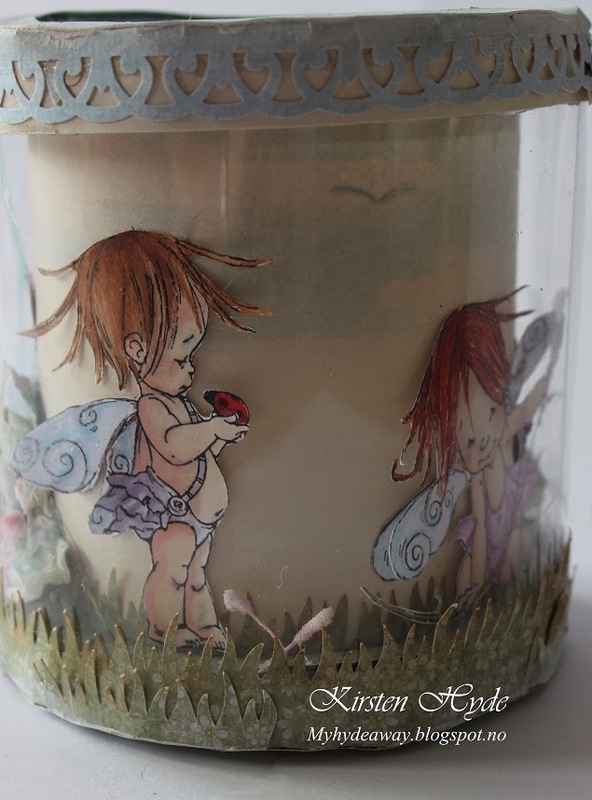 Some time ago, I found images from Nicecrane designs - and I thought these were gorgeous. I was thrilled when I was asked to be on the design team, as a guest designer. This is my first guest design contribution. Some time ago, I looked into making a 3D plane from paper. I found that this had been done a few times before - so I left it for some time. In my search for ideas, I found several simple toilet role planes. 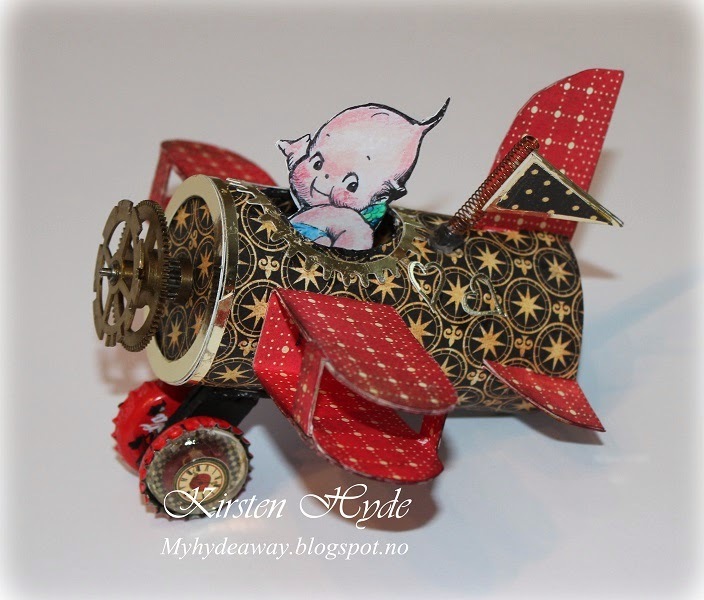 I was was also inspired by the colours and the simplicity of the Gentleman crafter's Christmas plane, made out of two boxes. 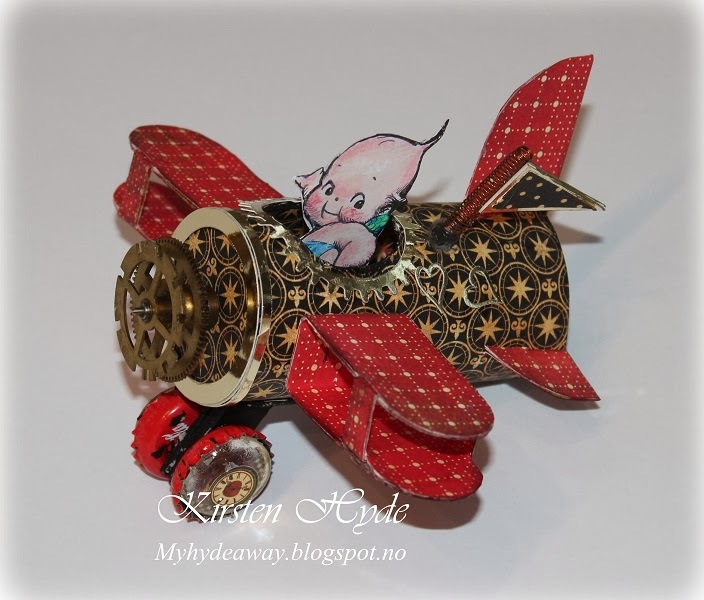 This plane is made of old papers and recycled materials, and it was quite simple to build. The body of the plane is made from a toilet roll. I have added the tail, which is made from packaging cardboard. The wings are made from the same material as the tail. The wings are glued and stapled to the toilet roll. 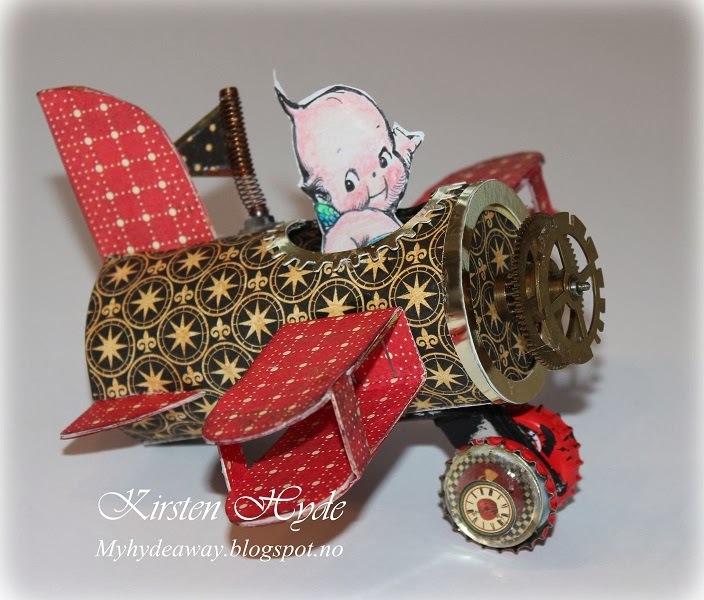 Inside the plane, I have put one of the Valentine Kewpies a digital stamp/ image from Nicecrane designs. This Kewpie has been printed out twice - and one of the images has been mirrored. I coloured the Kewpie with Prismacolors, cut out the images and glued them back to back. I used an old gear from a clock as the propeller. The wheels are two old soda corks with a round plastic resin inside. As the base of the pennant, I used an old spring from an old clock. The paper on the body of the plane is from G45 - Transatlantic collection. The paper on the wings and tale is from Basic, Grey: Hello Luscious - Zesty. The gold paper is from Søstrene Grene. The Kewpies were first printed over 100 years ago, in 1909, and was popular as characters in different magazines, as paper dolls and as dolls. For a period now, vintage images and figures has been popular again. 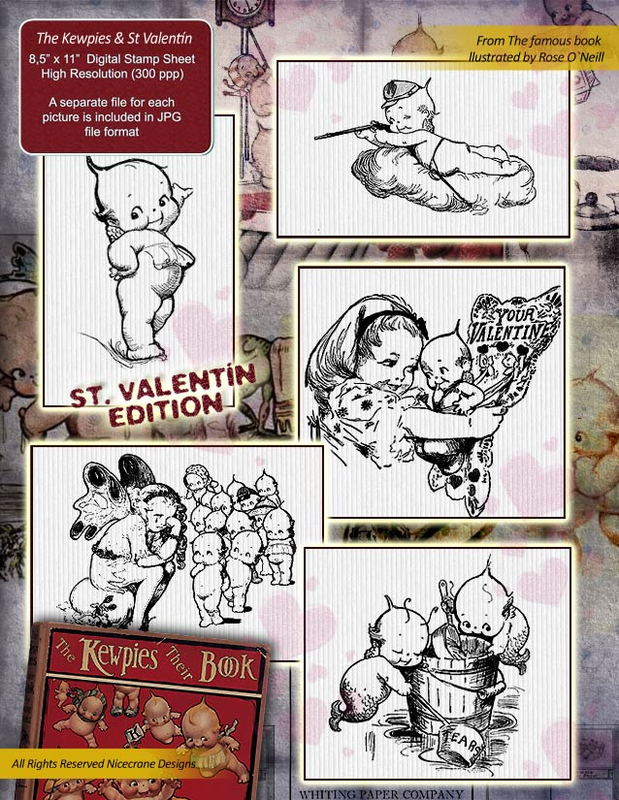 Nicecrane designs has several set of Kewpies images, but these are the newest ones. 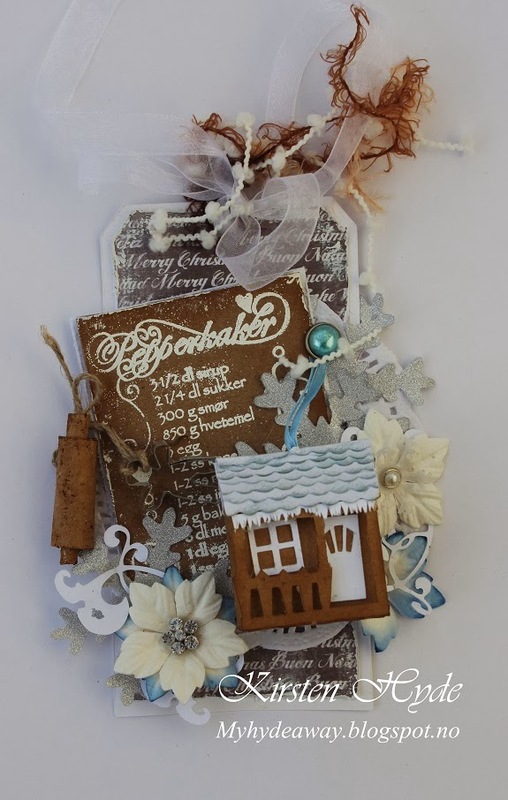 The original tag is made from a dies from Tim Holtz Sizzix Die TAG & BOOKPLATES Movers And Shapers. I have then added different dies cut out in cardboard and old soda tind. I have also used parts of old clocks and sewing machines. In the end, I have sprayed it with Dylusions spray – Melted chocolate and white spray paint. For effects I have used Distress Paint, MetaMica and Gesso. There is a new challenge at StampARTic . This time, the challenge is something old or reused. I have reused an old button, a cardboard box, an old lace and old computer parts. The ruler is from Prima. The mouse trap is an ordinary mouse trap from a hardware store. These are both coloured with alcohol ink. I have also distressed the mouse trap with distress embossing powder. Some of the text has been cut out on a silhouette, other parts has been written and printed out from a PC. The hand is a digital freebie from The graphic fairy. The red button is an old red button. Some of the gears are made by cutting in cork with a Tim Holtz gear dies. 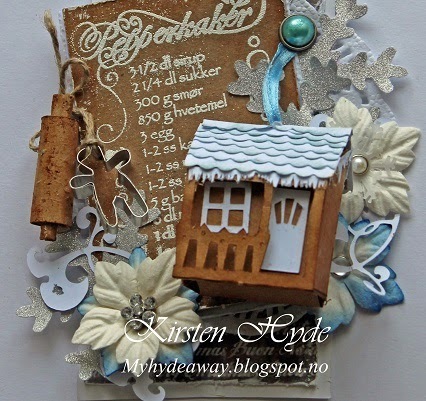 The original tag is made is a dies from Tim Holtz Sizzix Die TAG & BOOKPLATES Movers And Shapers. 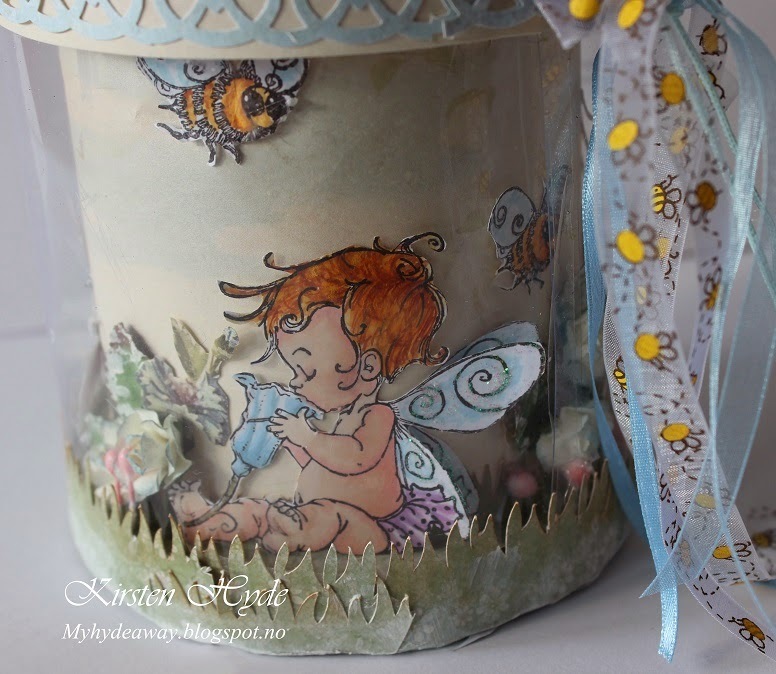 The paper is from Prima – Fairy Belle Collection – Firefly. The kids are from Minnehjørnet. This tag was number nine of a series of 12 tags in the December issue of the Norwegian magazine - "Ett trykk". I wanted to show different styles and techniques. This is an example of steampunk. Stampunk is a genre of Science fiction. One way to describe it is that it is the way people in the 19th century thought new inventions would look. Often industrial and steam powered machinery and often with gears. Steampunk is often brown, dark and maskuline. I find it quite challenging to create a lighter and more feminine steampunk style - but still within the steampunk genre. 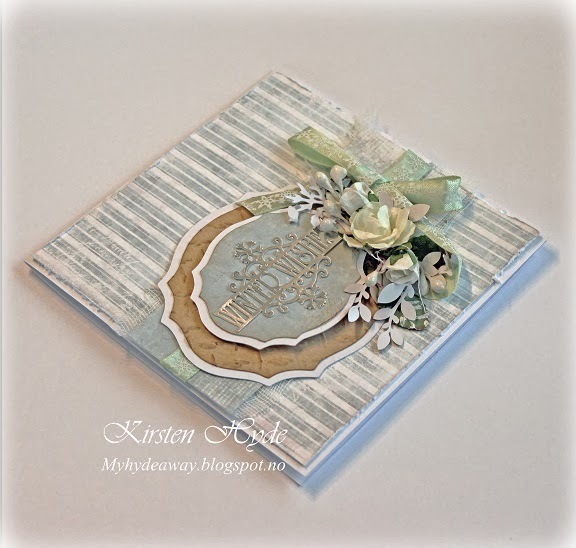 The original tag is made is a dies from Tim Holtz Sizzix Die TAG & BOOKPLATES Movers And Shapers. 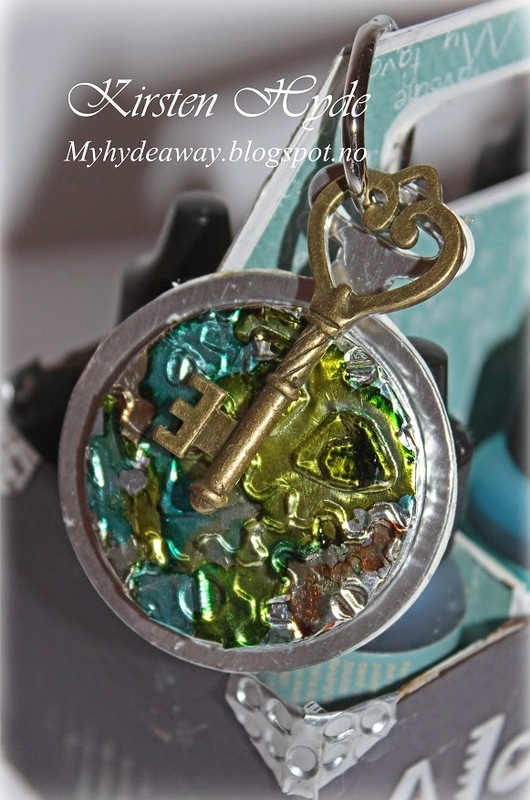 The key has been made using the dies Tim Holtz – alterations – Hardware Findings in cardboard. I glued several keys together to create the thickness. The key was then painted black, added distress embossing powder and MetaMica paint. The text: "Dear Santa. If down the Chimney you won't fit, the Door Key's Here for your benefit" was written in word, and printed on Kraft. The airship is my own design (but with inspiration from other steampunk images seen online) and made out of gold paper and oval glass resin. I have also used gears and bits from inside an old watch and an old CD rom. The stamp with the gingerbread recipe, is from Panduro. 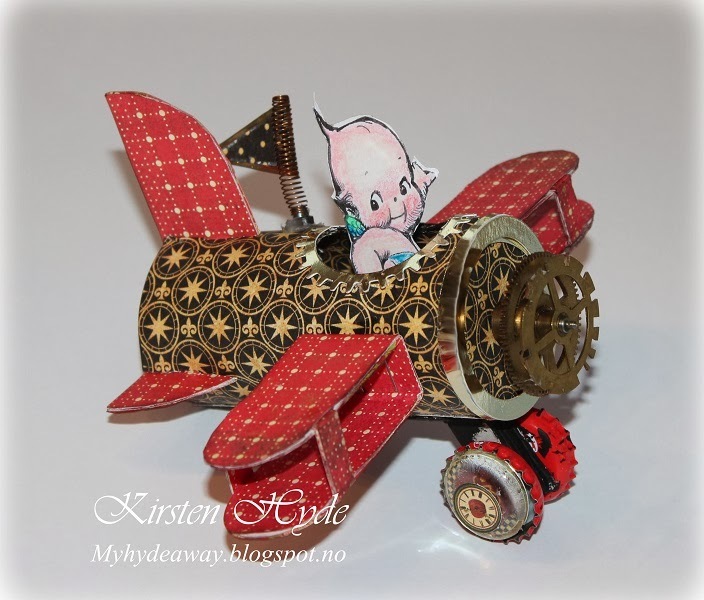 The paper used i Kraft and Panduro – Poppydesign – Vibeke Spigseth paper pad – Christmas. The rolling pin is made from to rectangle pieces of paper. One a bit wider than the other. The widest piece was rolled first, and the narrower piece was rolled over the top - in the middle. The cookie cutter has been made from an old soda can. I cut out two strips of metal (0,5 cm wide) from the soda can and glued them together (with the outside pattern glued together - so only the metal side could be seen). The metal strips was shaped into a cookie gingerbread man cutter and the two end pieces was glued together. The pop-up house has a rubber band inside, so it will pop open on its own. The gear dies are from Sizzix: Movers & Shapers Magnetic Die By Tim – Gears cut in cork. 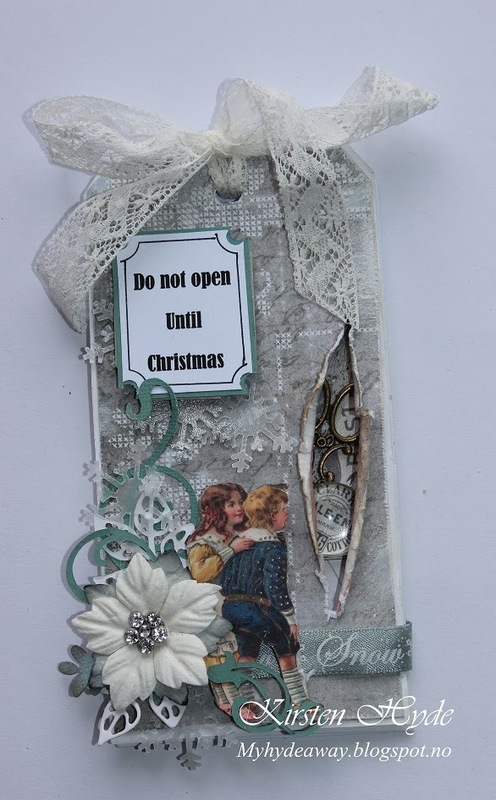 The original tag is made is a dies from Tim Holtz Sizzix Die TAG & BOOKPLATES Movers And Shapers. A lot of the other diecuts has been cut with a Silhouette or with scissors. The stamp is from Magnolia, and came with Magnolia Ink Magazine, 2012 6th edition. I have stamped on Kraft and coloured with Prismacolor. The paper is from Pion Design- Väntan på Tomten II- Tomten kommer and KaiserCraft – Periwinkle Collection. This tag was number five of a series of 12 tags in the December issue of the Norwegian magazine - "Ett trykk". I wanted to show different styles and techniques. 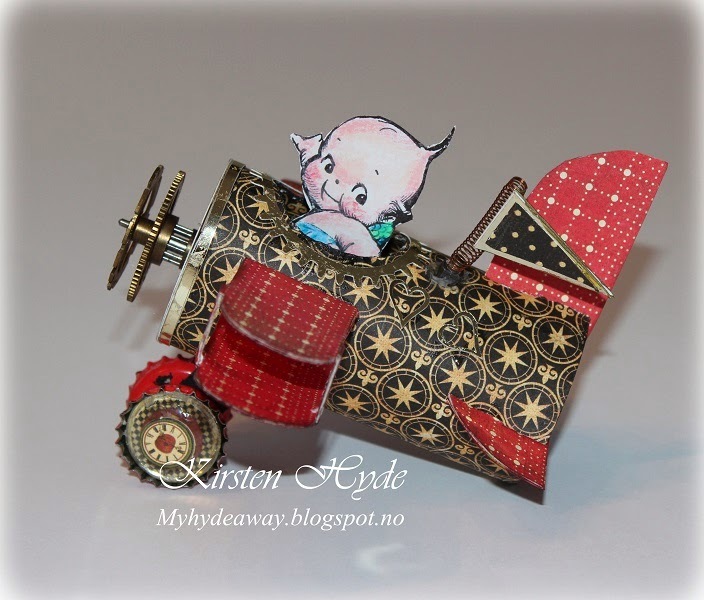 This is an example one way to use washi tape to create the background and simple 3d from a dies. Often, I look at my washi tape collection, and think - that they do look very pretty - but I do not really use them a lot. basically because I find it difficult to create a lot of different stuff and effects with them. I used im Holtz Sizzix Die TAG & BOOKPLATES Movers and Shapers to create the tag, and covered the tag with washi tape. 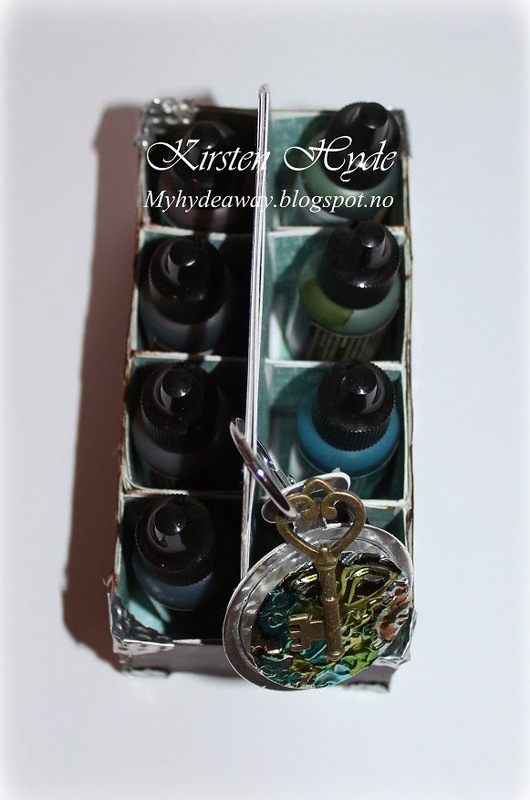 Then I painted the tag, and the washi tape, with alcohol ink. 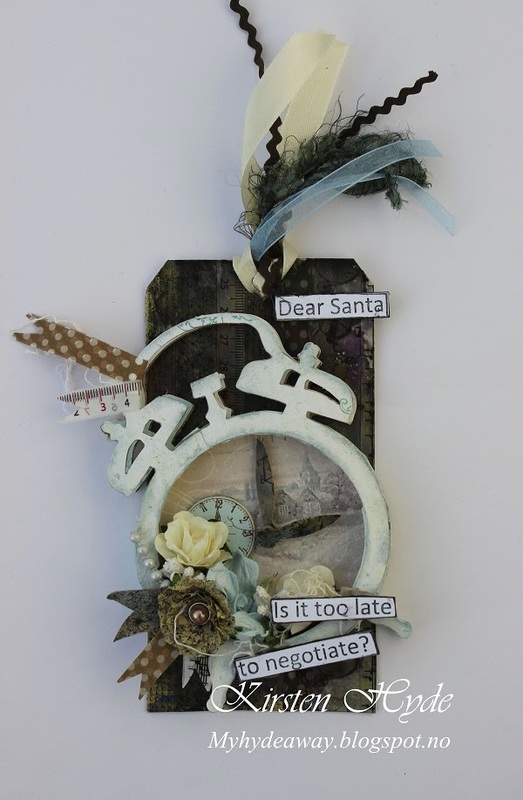 The clock is a dies made with Tim Holtz – Alterations Tick – Tock die. I made two clocks and mounted 1 cm of card between the dies to create a 3D effect. I also used Washi tape to create the beige flower in the clock and the banners. 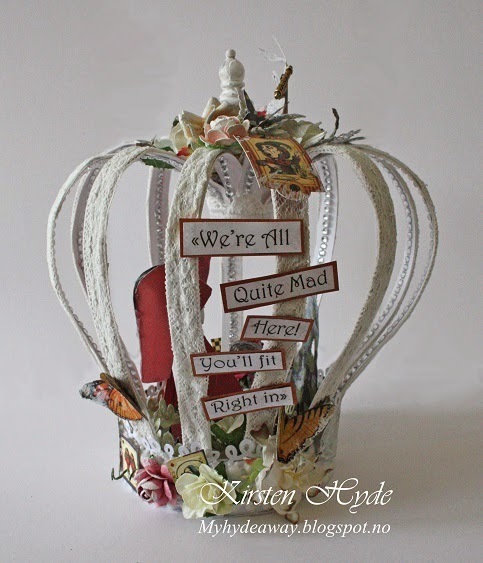 The text is a stamp from Dylusions Cling Mounted Stamp Set - Christmas Words. I have added a tutorial from Tim Holtz - on how to create the washi tape flowers. This tag was number four of a series of 12 tags in the December issue of the Norwegian magazine - "Ett trykk". I wanted to show different styles and techniques. This is an example of vintage. I also used origami to create the tree. 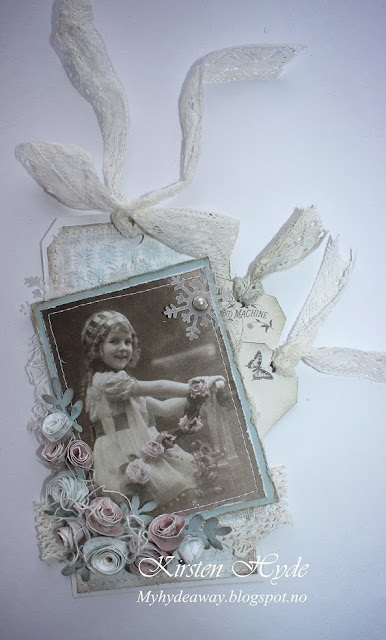 Vintage is a style where one often use old photos, light or brown colours, often with an aged or distressed effect. Lace and flowers are often used. I created the cones from left over paper and the tree from a coffee filter. I also wanted to show that a lot of the embellishment can be home made, The materials for a tag like this do not need to be large, but the effect can still be good. 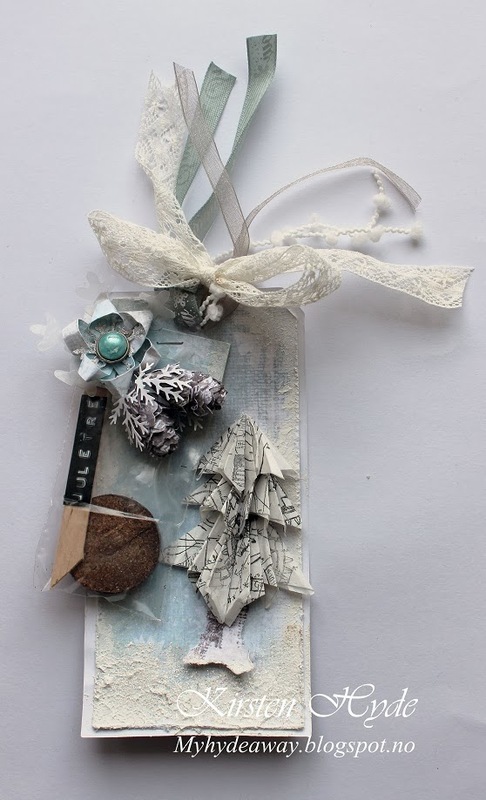 I have used Tim Holtz Sizzix: Movers & Shapers Base Die - Tag & Bookplates to create the basis for the tag. Background paper from Panduro – Poppydesign – Vibeke Spigseth paper pad – Christmas. I have added gesso with a spunge and added glitter to create the snow effect. 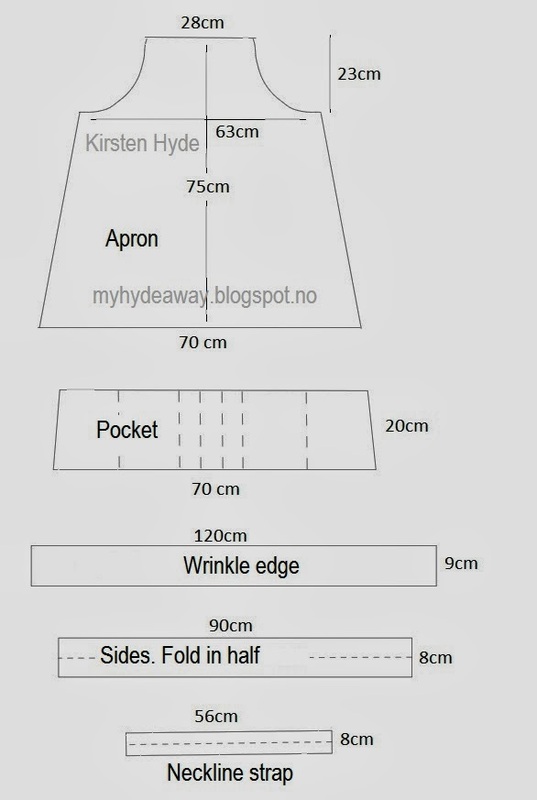 I have added a tutorial from you-tube on folding the tree. The cones has been cut with scissors from left over paper, glued and rolled. I have also added a small plastic bag with spruce seeds, a piece of peat for seedlings and an Ice cream stick - marked Christmas tree. If you ad seeds to your craft - be careful with sending it abroad. It is important not to send wild seeds abroad, as this can destroy the flora. Today we are going through different embossing techniques at StampARTic. 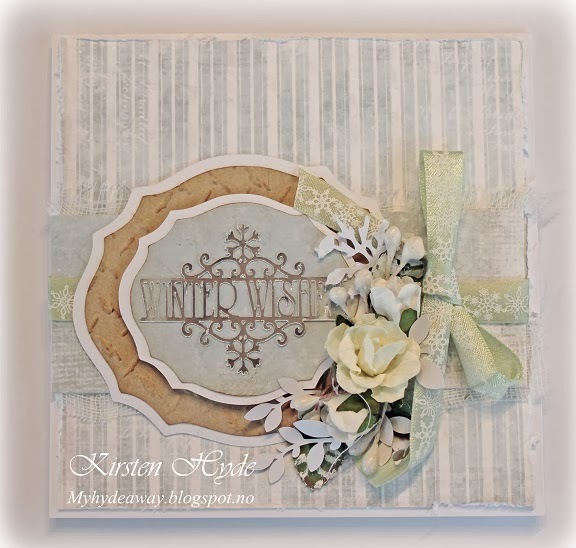 I made this winter card, using a dry embossing technique on kraft paper. I have made a winter card. This is quite an easy card. Papers are from Panduro. 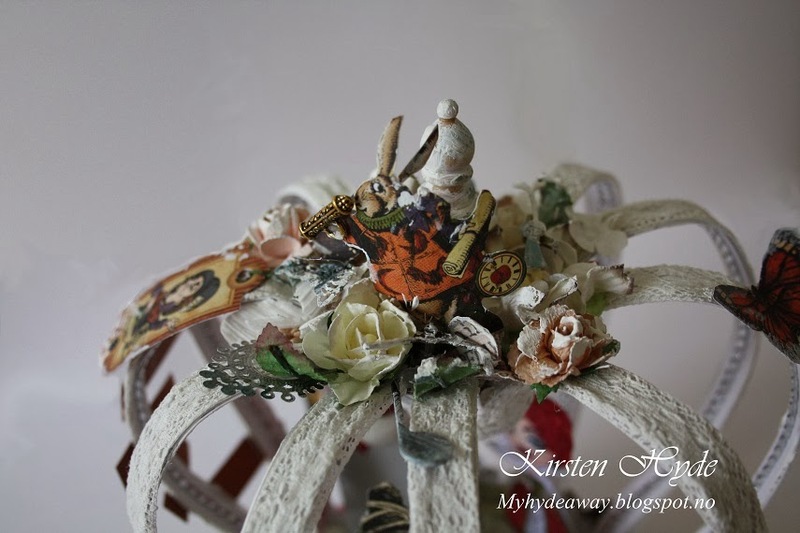 The Ribbon is an old Ribbon from Martha Stewart, from Hobbykunst. The roses are Mathia roses, also from Hobbykunst. The diecut "Winter Wishes" is a free cutting file from Bird Cards. Te diecut leaves is a Silhouette file. I have used dry embossing to create the effect in the Kraft paper. 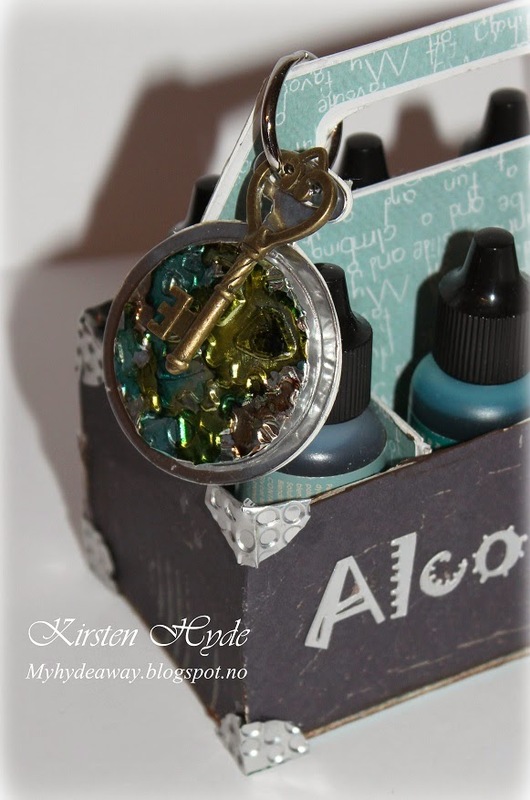 I used a - Sizzix - Tim Holtz Alterations - Diamond Plate Embossing Folder. I also distressed the raised pattern with distress ink, to create an extra effect in the pattern. Crafting and card making is often quite expensive, because a lot of tools are required. In the beginning it is difficult to invest in everything. For years I embossed with embossing folders and a rolling pin. This works fine for small embossing jobs. I have added a video to show you how. This tag was number three of a series of 12 tags in the December issue of the Norwegian magazine - "Ett trykk". I wanted to show different styles and techniques. This is an example of vintage. Vintage is a style where one often use old photos, light or brown colours, often with an aged or distressed effect. Lace and flowers are often used. 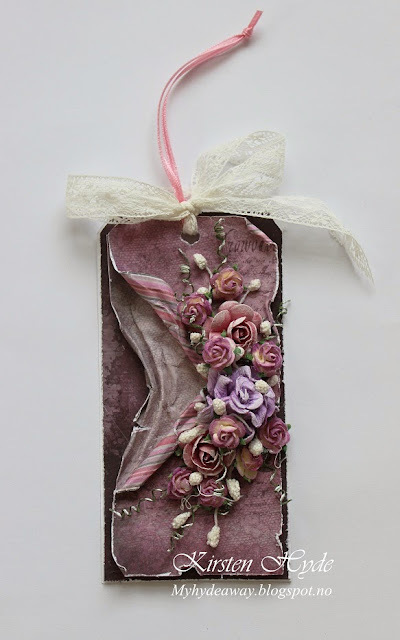 I also wanted to show that a lot of the embellishment can be home made, old lace can be used and you can also use materials not intended for card making (like car polishing wool). The materials for a tag like this do not need to be large, but the effect can still be good. Panduro – Poppydesign – Vibeke Spigseth paper pad – Christmas. The background has been distressed with vintage photo distress ink. I created several snowflakes, using Martha Stewart punch arctic snowflake and punched it out in Vellum. The roses has been cut out with scissors and glued, and rolled together as roses. The leaves are med from left over paper and a leaf punch. Under the roses, I used wool for polishing cars!. The lace is an old lace. This tag was number two of a series of 12 tags in the December issue of the Norwegian magazine - "Ett trykk". I wanted to show different styles and techniques. This is an example of Art Journaling and paper piecing. I have used Tim Holtz Sizzix: Movers & Shapers Base Die - Tag & Bookplates to create the basis for the tag. 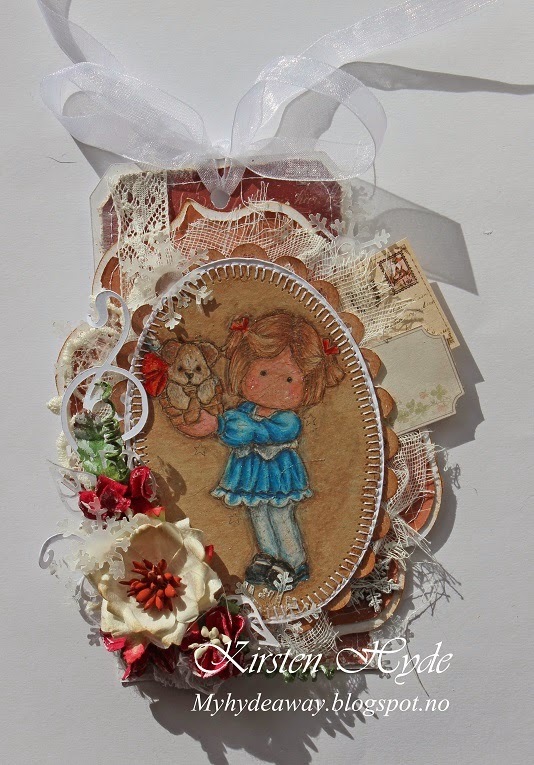 To create the background, I used Dylusions spray – Postbox red, squeezed orange and Cherry Pie. Heidi Swap – Color shine – Chartreuse. Then I stamped with Penny Black: Winter Scroll and Inkadinkado; Christmas Holiday sentiments and Christmas tree. I made the white effects by using a white pen. The teddy is a free digital stamp from Dustin Pike, coloured with promarkers. The underwear has been made with paper piecing. 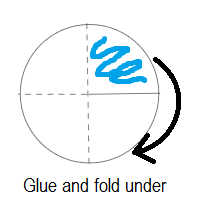 Paper piecing is a technique where you stamp the image onto several different papers, cut the different pieces out and glue them together to create the image. 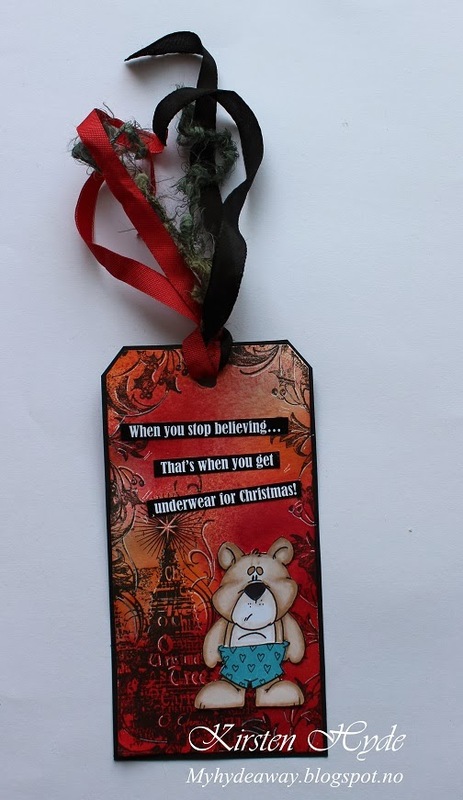 On this teddy, the underwear was printed onto blue card stock, cut out and glued onto the coloured teddy. This tag was number one of a series of 12 tags in the December issue of the Norwegian magazine - "Ett trykk". I wanted to show different styles and techniques. This is an example of layering technique, with different layers of paper. This time we are trying to inspire you to recycle and reuse to create something at StampARTic. After Christmas, we had a lot of thin cardboard boxes and soda cans left over. 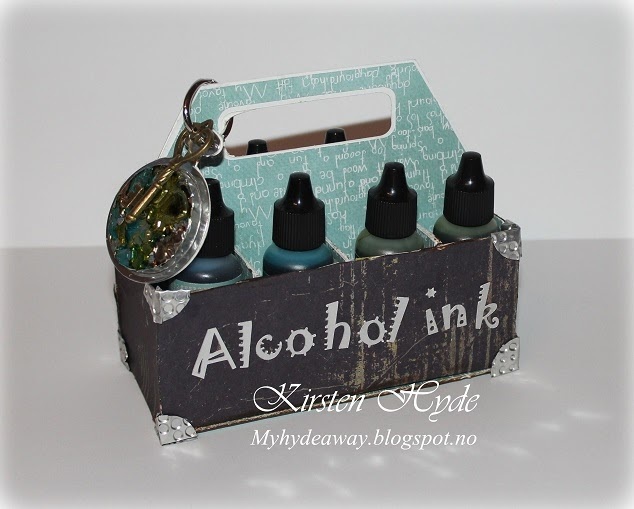 I uses some of the cardboard to create an Alcohol ink storage and the metal from the cans to create the corners on the box. The box will take eight bottles of alcohol ink. The papers are are some old papers, that I wanted to get used. I used old soda cans to create the metal corners. The soda can was washed and cut open. I used a circular punch to create the circle. 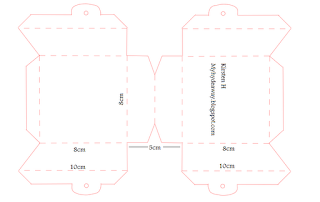 You can find the template for this storage box under. 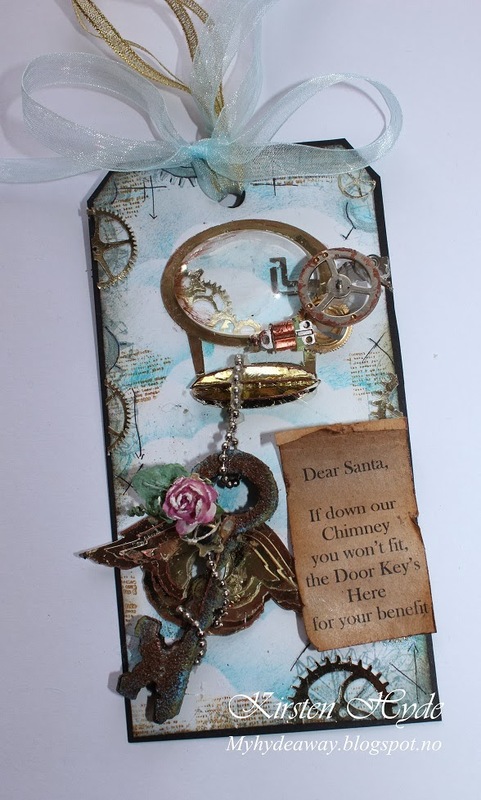 The small "Watch" is made by cutting silver coloured cardboard with Tim Holtz Alterations, Movers and Shapers, Pocket Watch. I have made a circular die cut out of cardboard from old packaging, covered it with metal tape and embossed the circle. I have glued the circle to the die cut watch with 3D foam tape and added alcohol ink to the top of the tape for effect. 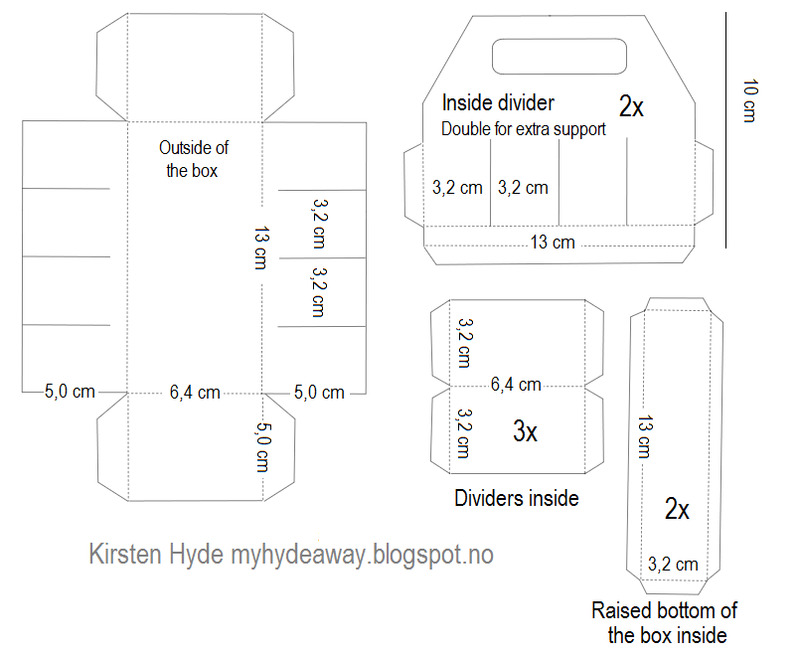 The 3 small dividers have to be placed in the the openings in the inside divider before gluing it inside the box. Also glue the raised bottom to the inside divider (one on each side under the 3 small dividers). I reinforced the space between the bottom and the reinforced bottom with extra layers of card. 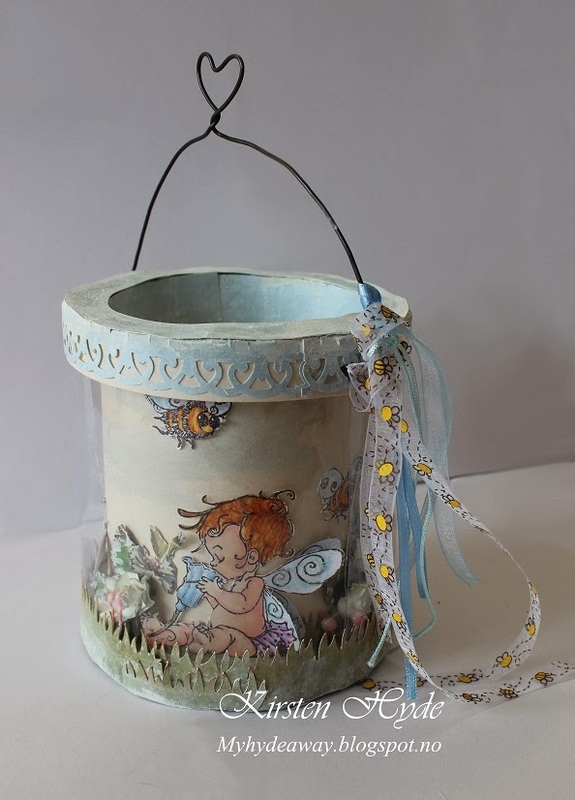 This is a gift bucket that was published in October in the Norwegian magazine - Ett trykk. 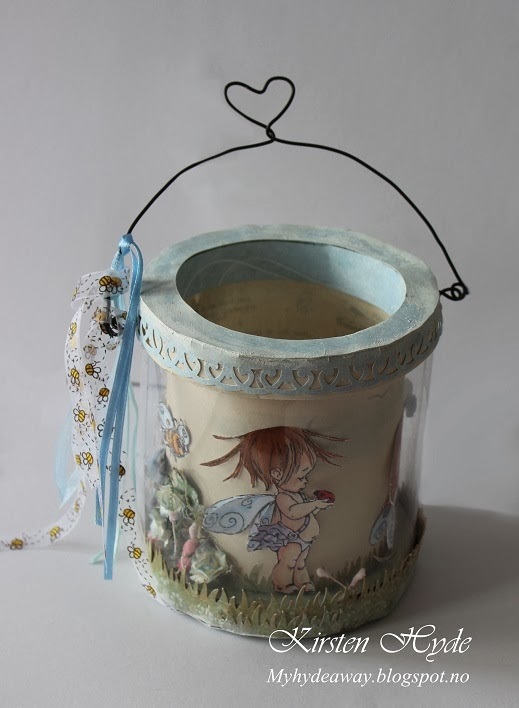 The bucket has room for a gift, and was made 3D with acetate outside so the scene inside the edges of the bucket can be seen. 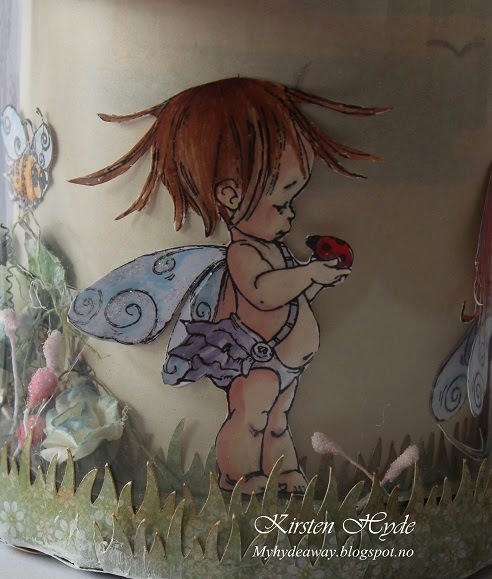 The stamps are from Penny Black: Fairy Sweet - Clear Stamps. I think they are adorable. The stamps are coloured with Promarkers. The grass is a Silhouette file. The background paper is from Pion design. I have used a Martha Stewart edge punch to create the boarder at the top. I was Guest Designer for the Norwegian magazine "Ett trykk" in October, and I still have a few items left to publish in my blog. This was a birthday crown made for a friend, instead of a card. This friend is also a scrapper and has often taken the initiative to make crowns for others for fun for their birthdays - so I decided that she needed a crown for herself. She is very found of G45 - so this brand of papers had to be included in this project. The inspiration for the shape of the crown came from a metal crown. 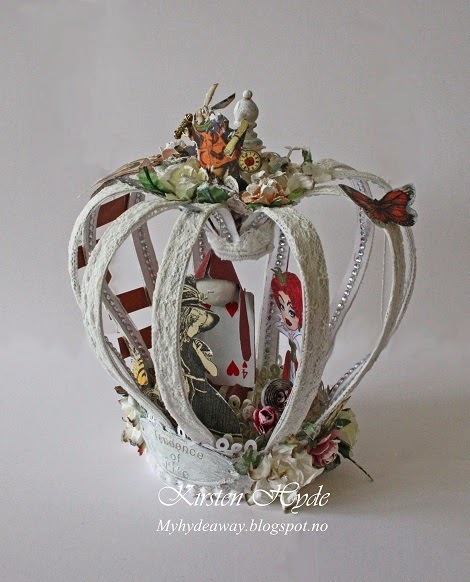 The crown has been made from card stock and decorated with cut outs from Halloween in Wonderland from G45. The Queen of Hearts is a digital stamp from Sassy studio designs. The "card man" is made from a small playing card, with a polystyrene ball as a head. The hat and feet/stand is made out of paper. 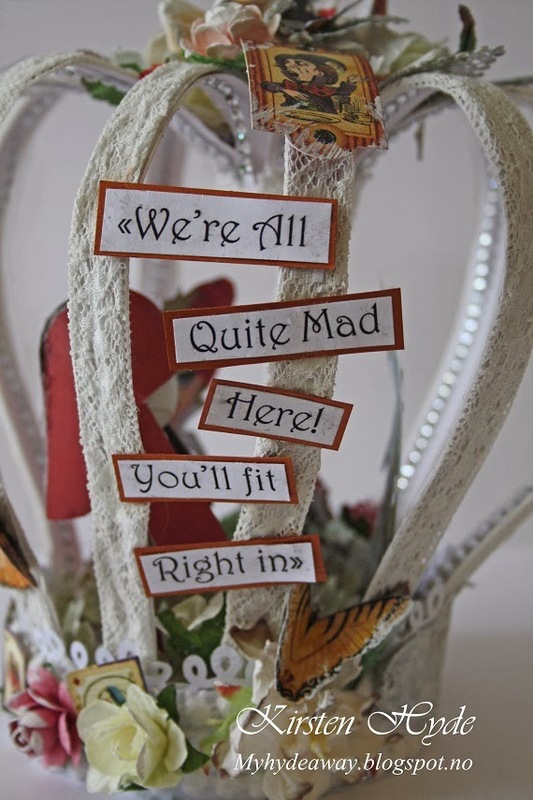 The text "We're all quite mad here! You'll fit right in" is a well known quote from the Alice in Wonderland story. On the top of the crown, I have used an old chess piece. I have coverd the top with flowers and diecuts. The crown from the back. I was Guest Designer in Ett trykk in October. 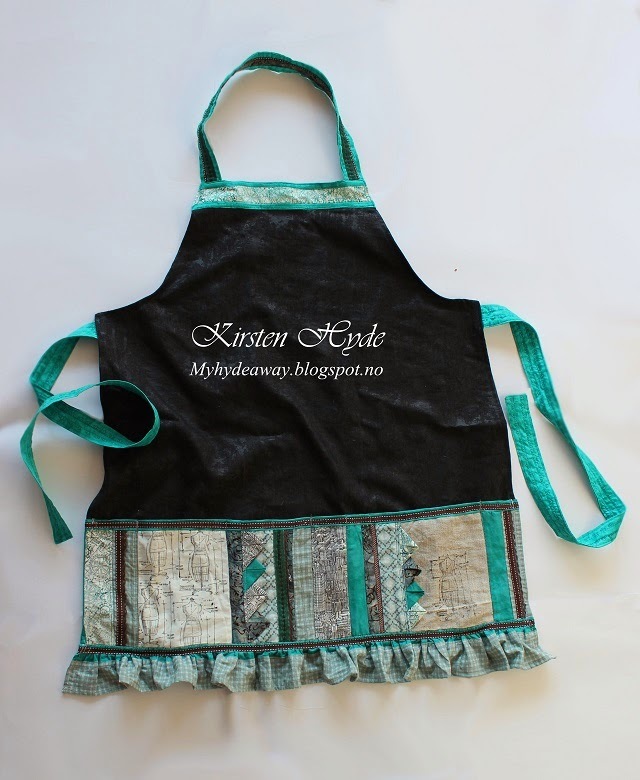 This apron was one of my items published in the magazine. 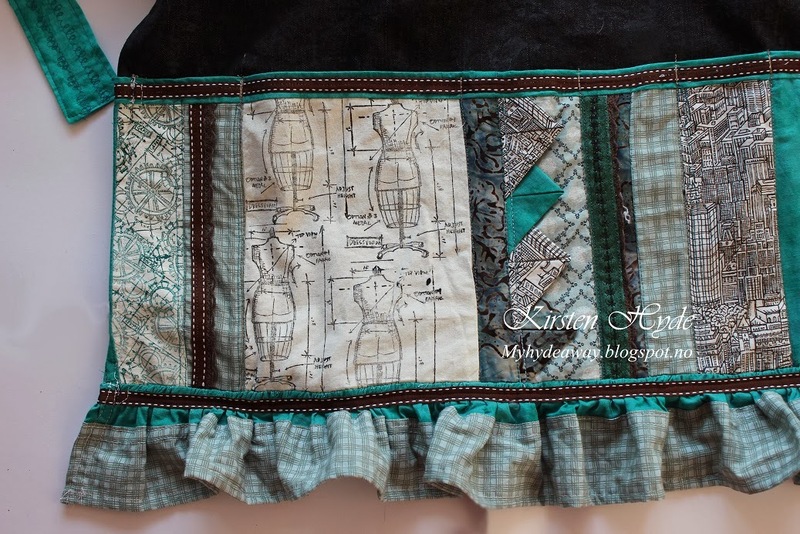 This is made as a craft/ Scrapbooking apron with pockets in the front (under the quilt), with room for scissors, glue and other things. 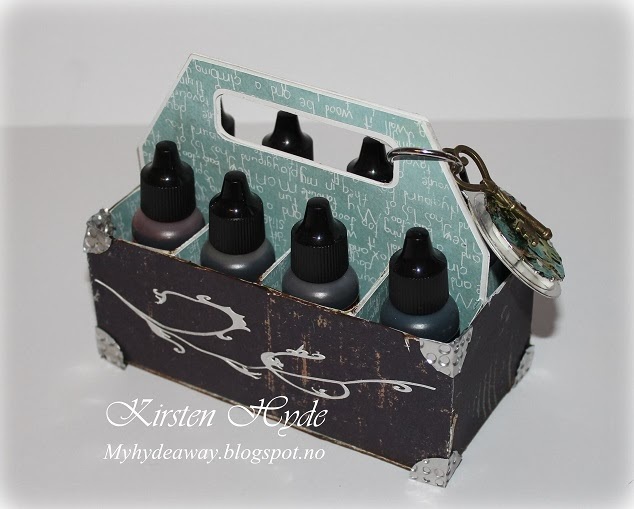 I really wanted to use some of Tim Holtz new Eclectic Elements fabric - but this was difficult to get hold of i Norway at the time, so I made my own Tim Holtz inspired fabric instead. I stamped with Tim Holtz stamps and Panduros Fabric ink on plain cotton fabric. I wanted a funny label. I made my own label with a mixture of some of the quotes I found. Templates, patterns and Copyright - Please read. 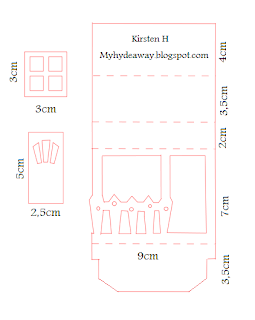 This is my own pattern/ template. 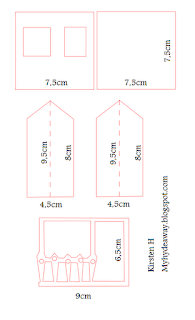 You are free to use my templates, and publish your own craft. However, it would be nice if you link back to me. Please do not sell or publish my templates, as they are or edited! My templates are copyrighted by law. Dette er min egen mal / mønster. Du kan fritt bruke mønsteret til å lage dine egne arbeider. Du kan også fritt publisere ditt eget arbeide. Jeg ville imidlertid satt pris på om du linket tilbake til meg. Du har ikke lov til å publisere eller selge mine maler eller mønstere, som de er eller redigert. Mine maler har copyright under Åndsverksloven.